About the local area at Hemsford Yurt camp, Devon yurts - DEVON YURTS Glamping in Style! 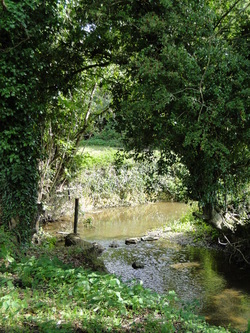 Hemsford is located within 2 miles of a pretty well stocked community run village shop at Broadhempston and within 2.5 miles of Riverford Organic Farm shop. Riverford is one of the largest organic farms in the UK and is well known for their “vegetable boxes”. These can be delivered directly to your Yurt providing 3 days notice is given prior to your arrival – please ask for details at the time of booking. Major supermarkets and pharmacies are in Totnes which is 3 miles away. Totnes is a bohemian Town known for its alternative lifestyle, with many restaurants, bars and street café’s which serve an excellent choice of menus to suit all tastes. Totnes is one of England’s oldest boroughs, the first bridging point over the beautiful River Dart. The town is noted for its ruined Norman Castle, 16th century Guildhall and Elizabethan Butterwalks. From Totnes you can take a trip through some of the West Country’s most beautiful scenery down the river to Dartmouth. There are several outstanding beaches within easy reach, amongst them Blackpool Sands, Thurlestone, Bigbury and Bantham with the highest standards of bathing water quality. Also around the coast are many sheltered coves and beaches to be discovered such as Slapton Sands near Kingsbridge. Bantham and Bigbury both are fantastic locations for surfing, or just beach combing, cycling, walking and enjoying the fabulous scenery that South Devon can offer. For those who are interested in sampling the local inns and pubs there are several pubs within the local area, the Community owned pub, The Tally Ho Inn at Littlehempston, the Pig and Whistle at Littlehempston,both within walking distance (about 10 -15 minutes), and slightly further away at Broadhempston the Coppa Dolla and the Monks Retreat, and at Staverton there is also the Sea Trout Inn. All these local pubs serve locally sourced food and an excellent selection of wines and ales. Many people chose to relax in the quiet country surroundings however if you are interested in outdoor activities, there is a local riding stable nearby at Staverton. An indoor heated Swimming Pool at Totnes and cycle hire at Hot pursuit in Totnes industrial estate. Other attractions within driving distance are include major theme parks such as Woodlands Leisure park near Dartmouth, Splashdown at Paignton, Kents Cavern, Babbacombe model village, Paignton Zoological Park in Paignton, Living Coasts at Torquay and many others. Also well worth a visit is the Primrose Line, steam railway running through the picturesque Dart Valley from Buckfastleigh to Totnes, passing through Staverton. All details for the above are available locally from Totnes Tourist Information centre. Further details can be supplied on request. 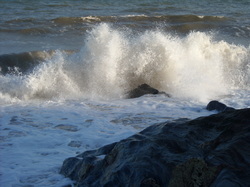 This picture shows winter waves crashing on the rocks at the beach at Slapton Sands, near Kingsbridge. One of our own favourite places to visit with the famous Slapton Ley - a fresh water lake adjacent to the beach with fabulous facilities for bird watching. The beach is steeply shelving and made up of mainly shingle, but has safe and clean bathing waters and is very popular for families.